The Port of Portland will pay shippers for their patronage during a four-month shutdown of the locks system on the Columbia and Snake rivers, according to a plan approved by commissioners Wednesday. Last year, eastern Oregon and Idaho farmers shipped more than 2,000 containers of hay and other products by barge downriver to Portland for loading at Terminal 6 for shipment overseas. 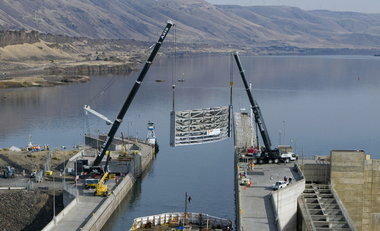 Barges go through locks at The Dalles, John Day and Lower Monument dams on their way to Portland. It is the cheapest route for exporters. But the U.S. Army Corps of Engineers plans to replace the locks, shutting down river traffic for 16 weeks beginning in December. Shippers would then find it cheaper to truck products to ports in Tacoma or Seattle. "We'd like to minimize that and retrain as much cargo as possible during the closure," said Tom Imeson, the Port's public affairs director. The commission agreed to set aside $800,000 to subsidize rail and truck shipments to Portland. The Port will pay shippers $400 a container for rail shipments from Lewiston, Idaho, and $250 per container moved by truck from Umatilla and Boardman, until the locks reopen or the $800,000 runs out. The payments will not cover the total shipping costs but are designed to maintain Portland's competitive advantage. The program will do nothing for barge companies, however, which will lose business for the duration of the shutdown. Tidewater Holdings, Inc., the company that operates Tidewater Barge Lines, said earlier this month that it will temporarily lay off up to 200 employees, a majority of its work force, during the closures. Maintaining good relations with upriver customers is also an important objective on the program. "I hope we get a public relations bounce with our eastern Oregon neighbors," said Commissioner Ken Allen. Jeff Smith, president of Local 8 of the International Longshore and Warehouse Union, said the move will help keep jobs from leaving the Port --perhaps permanently. "Our biggest worry is once they go to Seattle or Tacoma, we're not going to get them back," Smith said. "We can't afford that."